Was the legendary “Manassa Mauler” Jack Dempsey really one of the greatest heavyweights of all time? Revolutionary theorists (the majority of whom are made up of some of boxing’s newest generation of fans) would have us believe that Dempsey was undeserving of the near-century of unadulterated adulation that has been fettered upon him. They would have us believe that Dempsey was little more than a crude brawler with little skill who defeated no-one of historical consequence, avoided the most dangerous contender for his crown, and lost decisively on two occasions to the only serious challenger he face during his seven year reign. I am one of those aforementioned unadulterated Dempsey adulators. 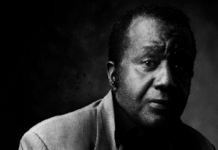 Until I discovered Dempsey in the mid-1970s, I was no boxing fan. Sure, I was aware of Muhammad Ali, but I saw him more as a comic figure who occasionally appeared on TV than the greatest athlete of the 20th Century – who he unquestionably was. Having said that, I was only a schoolboy growing up in the North of England, and more accustomed to the exploits of Leeds United and Liverpool FC than any boxers, no matter how incredibly famous throughout the rest of the world they may have been. I can still remember the first time I came across Jack Dempsey. It was after school one evening. Rather than go straight home to what was a stressful family life, I had taken to spending time in the local public library. At that point of my young life, I was a fanatic of military history. Tanks, aircraft, WW2 – I absorbed all the information I came across like a teenage sponge. Back then, novels weren’t my thing, but I loved reference books. As a kid who was interested also in movies, music and sports, I would always browse the reference shelves, and it was on just such a sortie I came across Harry Carpenter’s Pictorial History of Boxing. I pulled it from the shelf, opened it roughly in the middle, and was instantly appalled and intrigued at the grainy image I saw before me. The image was stark, brutal; a dark skinned, gaunt faced and incredibly tough looking boxer was staring intently at his stricken rival, who was sitting in a corner, face down – looking thoroughly defeated. As I began to read the facts behind the picture, my horror was only matched by my complete and utter fascination. 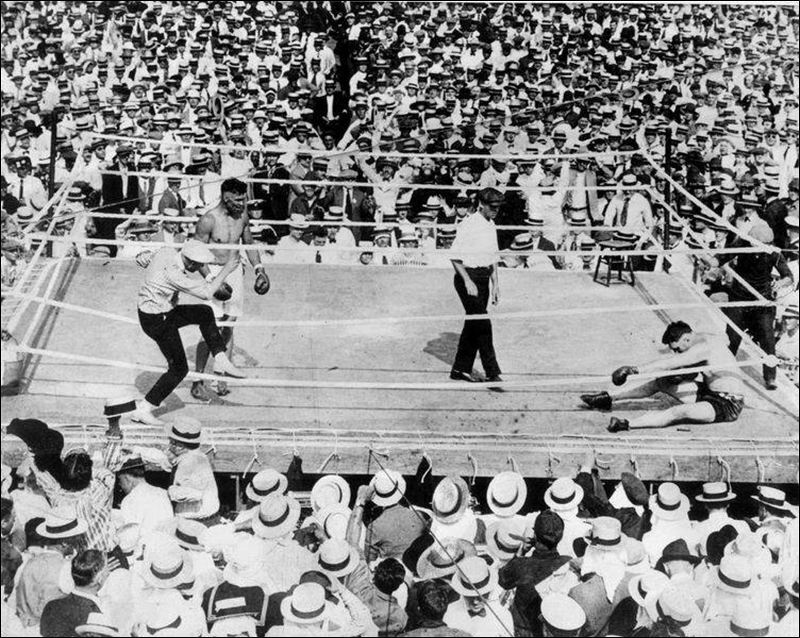 Jack Dempsey was 6’1” and just 182 lbs., while Jess Willard, the defending champion, was a 6’6” – 250 lb. giant, yet Dempsey had inflicted quite the most frightful beating on him with just his bare hands. ”Broken ribs, broken cheekbone, teeth knocked out, cheekbone sticking out of his skin, seven first round knockdowns..”, the words leapt off the page and hit me between the eyes. From that moment on, I was a fight fan, and boxing had supplanted my passion for aircraft and tanks and totally as Dempsey had destroyed Willard. What became clear was that Dempsey would forge for himself a fighting style that was groundbreaking and revolutionary among the big men. Technical boxing had improved vastly in the gloved era, first with elegant ”Gentleman” Jim Corbett, and then with sublime Jack Johnson. Jim Jeffries proved that there would always be a place for size, strength and power. But Dempsey was the first heavyweight to display blinding speed and savage aggression in an attacking role. Fighting out of a crouch and displaying a level of intense ferocity that decades later would be the main inspiration for a young Mike Tyson, Dempsey would set about his rivals with a blend of vicious head shots coupled to a truly withering body attack. 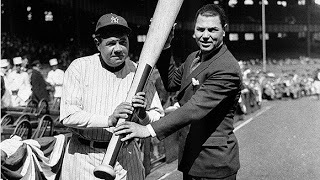 He was a decent size for a heavyweight, although not especially large, even for the early 20th century. 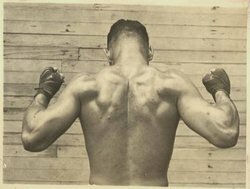 But there was not an ounce of spare flesh on the young Dempsey, and he carried the same level of muscle-tone into the ring as the era’s welter and middleweights. He also had the speed of a much smaller man, but there was nothing remotely lightweight about his punching power, which was arguably the most concussive the sport of boxing had seen. 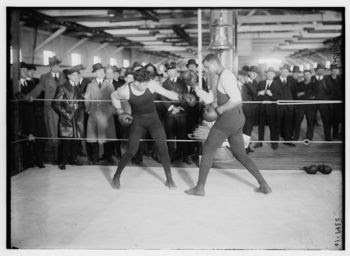 Dempsey turned professional in 1914 with a draw against Young Herman. Even as a raw novice his power was clearly there, as he bowled over his next three opponents in a round apiece. He suffered his first loss – a four round decision to Jack Downey in 1915, and then went unbeaten for two years and 25 fights (14 KOs). 1917 was to be the pivotal year in the carreer of the young Dempsey. 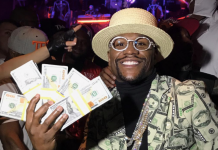 He entered 1917 as a 21-year-old with a 24-1-5 record, and would exit it with a 30-3-9 slate, his reputation tarnished, but ultimately a vastly improved fighter. Dempsey began 1917 disastrously – at least on paper – suffering a first round knockout at the hands of Fireman Jim Flynn. There has been speculation as to whether the Flynn loss was on the up-and-up or whether Dempsey took a dive. Reports say the Dempsey was out for a good 20 seconds after being hit by a short but powerful right hand to the chin. 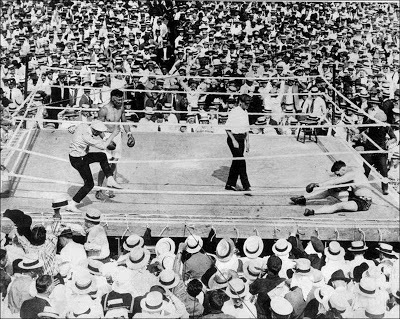 Flynn was certainly on the slide as a fighter, and had gone into his bout with Dempsey on the back of a losing sequence of five straight, his last two being kayo losses against giant prospect Fred Fulton in two rounds and former light heavyweight champion Jack Dillon in four. 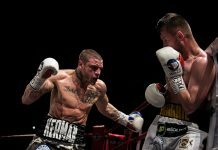 Flynn had lost 19 of his previous 30 fights and was in a steep decline, so the KO over Dempsey would appear to be something of an aberration. Dempsey could only draw his next bout against novice journeyman Al Norton, then lose a four round decision to Willie Meehan, an unusual character who would become something of a thorn in Dempsey´s side. Just 5’9”, and a one time flyweight who had bulked up all the way to heavyweight, Meehan never trained or ran, was described as being ”hog fat”, yet went 2-1-2 with Dempsey. In a rematch with Norton, Dempsey was held to a draw once again, but would kayo him in one round the following month. Dempsey scored points wins over contenders Gunboat Smith and Carl Morris to see out a frustrating year. Next articleNonito Donaire vs Guillermo Rigondeaux – Who Wins The Most Anticipated Super Bantamweight SuperFight In Years?